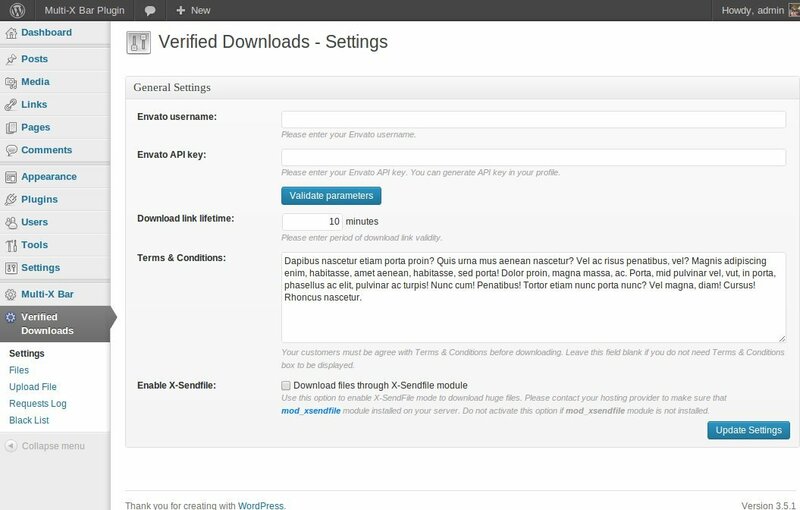 Verified Downloads is a solution for Envato authors. 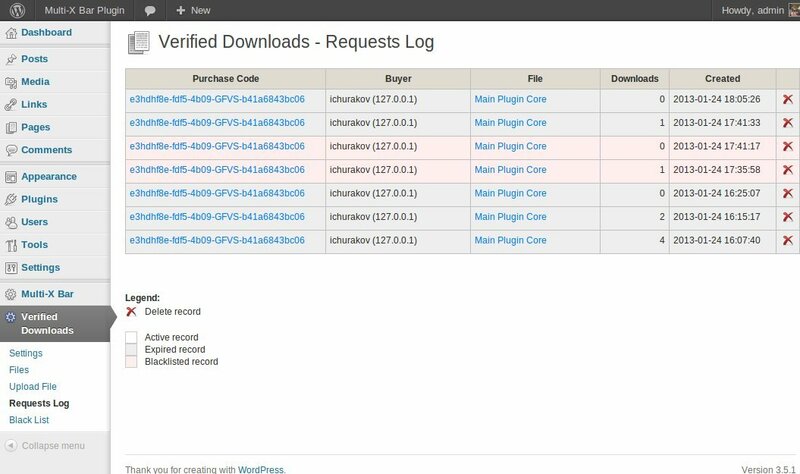 With this plugin only your Envato customers (and nobody else) can download files from your website. People must enter Item Purchase Code, received with purchased Envato item, to get the download link. The link is encrypted and valid limited period of time to avoid its sharing over Internet. As an administrator you can decide either users must purchse certain Envato item to have a chance to download the file (for example, before downloading file ”#1”, user must buy item A from Envato), or the file is available for all of your Envato customers. Use Verified Downloads to distribute free stuff (such as add-ons, bonuses, gifts, patches, etc.) among your customers. It will stimulate people to purchase your items from Envato. Downloads only for Envato customers: nobody else can download your files. Item Purchase Code verification: Item Purchase Code is verified using Envato API. Boost Envato sales: create valuable advantage for buyers. Associate files with Envato Items: before downloading file ”#1”, user must buy item A from Envato. 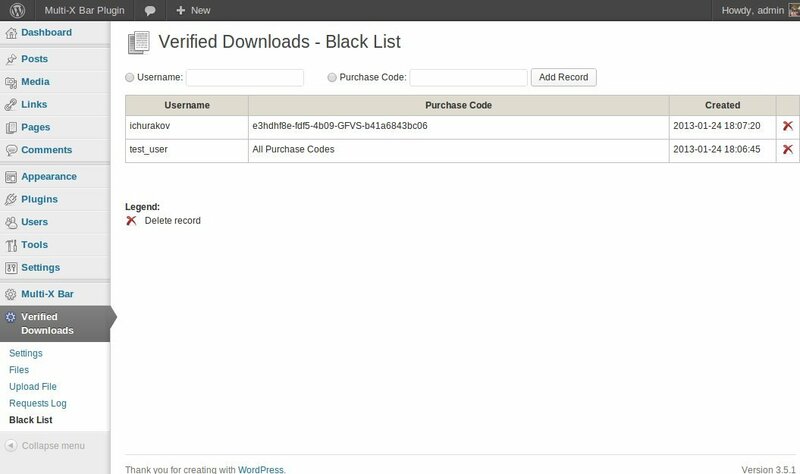 Black list: you can block any Item Purchase Code or username to avoid illegal activity with them. FTP upload supported: you can upload large files through FTP-connection (upload to folder /wp-content/uploads/wped/) and assign them in “Upload New File” section. Modern sign up form: CSS3 AJAX-driven sign up form. Shortcode driven: insert shortcodes like [wped id="X"]. The best way to understand the idea of Verified Downloads is to see live example. Click “Live Preview” or visit demo link. On “Live Preview” website you can enter Item Purchase Code and get download link with limited period of validity. Install and activate the plugin like you do with any other plugins. 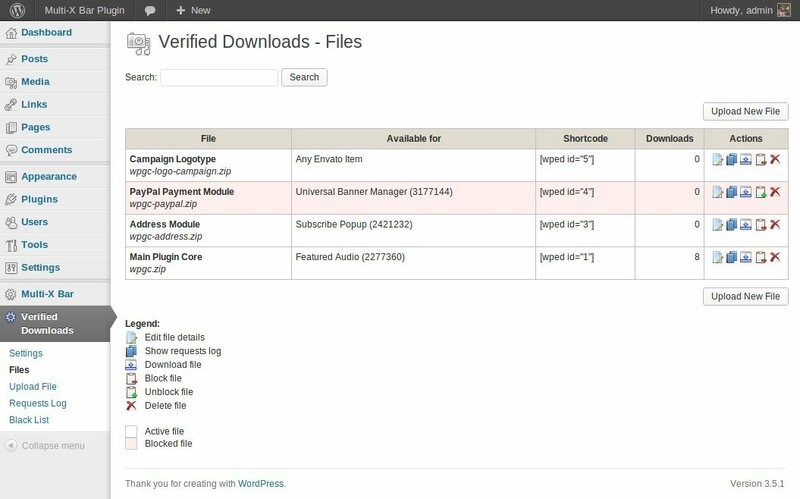 Once activated, it will create a menu “Verified Downloads” in left side column in the admin area. Click left side menu “Verified Downloads >>> Settings” and do required settings. Set your Envato username, API key, download link lifetime, etc. Please look at the screenshot section to see what kind of settings you can do there. 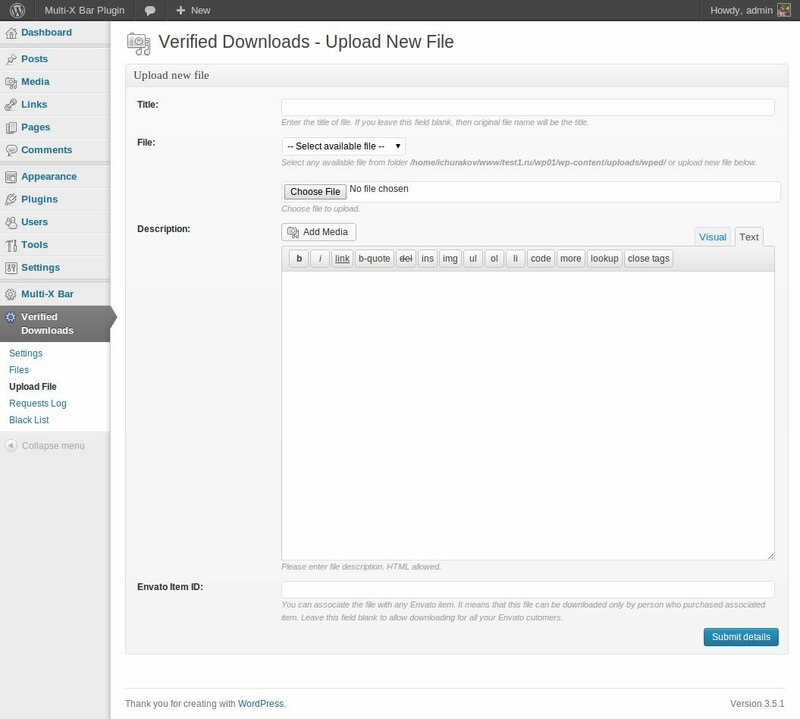 Click left side menu “Verified Downloads >>> Files” and upload the files that you would like to distribute. Once file uploaded look at column “Shortcode”. 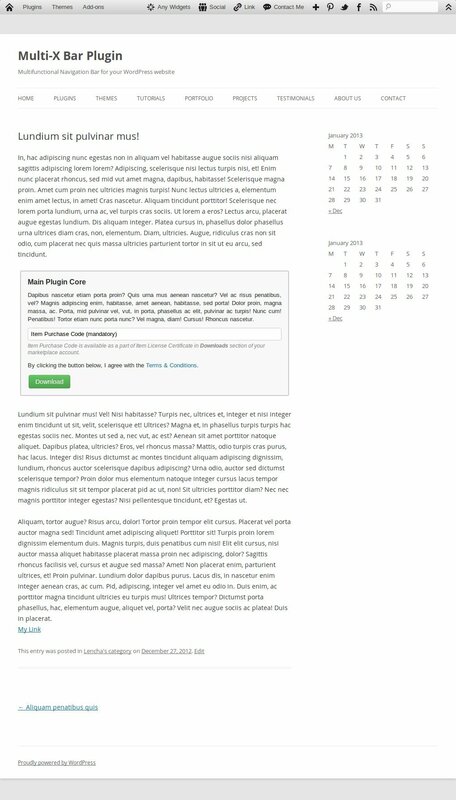 This is short code which you can insert into your posts or pages. The short code is like that: [wped id="X"] (X – is an ID of file). Go to any post/page edit page and insert shortcode there.